Getting what you pay for really stands true in this machine! 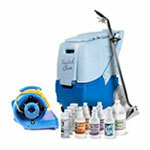 It is a basic non-heated carpet cleaning machine, at an extremely affordable price. 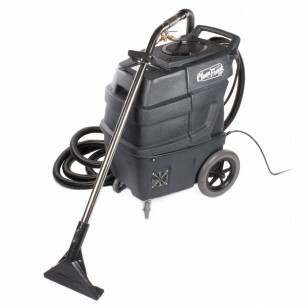 This 100 PSI carpet extractor from CleanFreak offers a great value compared to other models in its size range. This unit comes standard with a single jet 12 inch drag wand, which is great for cleaning rugs and carpets. The drain hose needs to be disconnected from the rear of the machine to dump the recovered cleaning solution. It is a very simple machine with no bells and whistles. This makes it very easy for any operator to use, as well as minimizing the amount of potential maintenance it may need down the road. If you are looking for something a little more powerful, please take a look at our complete line of cold water carpet cleaning machines and heated carpet extractors. The rotationally molded poly tanks hold 11 gallons of clean solution, and can hold 13 gallons of recovered solution. (*Note: We recommend always using a defoamer solution when recovering solution, to knock down foam, and help protect you vacuum motors). The two 2-stage vacuum motors will last a lot longer if they are cared for, and no moisture is allowed near them. There are 2 vacuum switches on the back of the machine, use both when cleaning large areas of carpeting for maximum recovery, and use only one when cleaning rugs and mats, where maxiumum suction is not needed. The 110 volt power cord is 25 feet long, and will operate off of a normal 15 volt circuit in most cleaning situations. With the 25 foot vacuum hose, this gives you a 50 foot cleaning radius from any electrical outlet. This should be more than enough to clean any residential home, commercial business, or other venue. Rotationally molded polyethylene body makes the machine durable and portable. Powerful two 2 stage vacuum motors provide plenty of recovery suction power. Can use one vacuum motor for cleaning rugs, or both motors for normal carpet cleaning. 120 volt AC, pulls 12 amps on under a normal load, on most carpet cleaning jobs. Easy access to all mechanical components for regular maintenance. 10-inch non marking rear wheels and 3-inch non marking casters, make transportation easy.